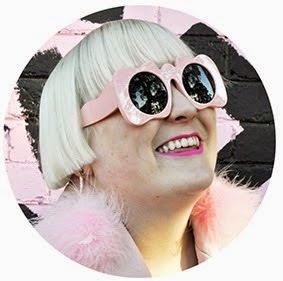 I don't believe in basics, well not in the way that nearly every magazine or fashion blog preaches their importance to your wardrobe - "The 10 must have winter basics you need have in your wardrobe now" with a list of mostly black, white and denim pieces that are all incredibly boring to my eye. 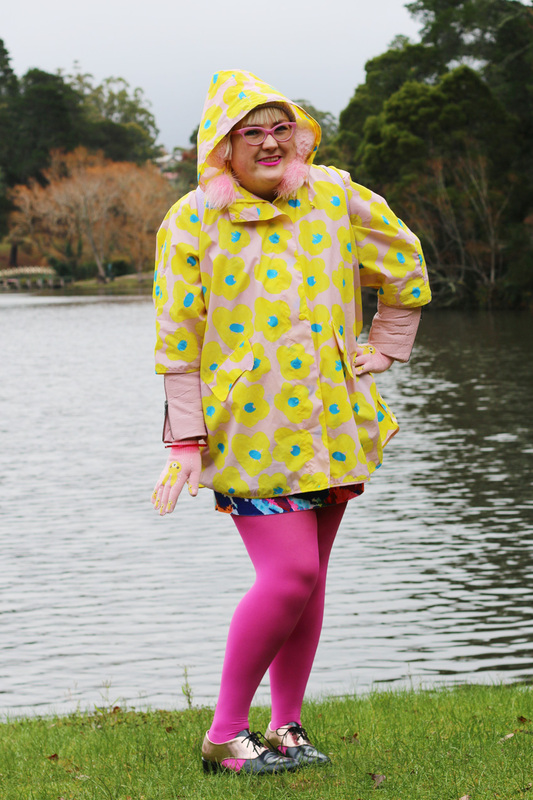 For me my winter wardrobe basics are of the loud and bold variety, sure I need a raincoat but make mine yellow with bright flowers all over it. Pink tights replace black tights, a cute pink beanie instead of a grey one, pink patterned gloves and so on, you get the picture - give me all the colour please! 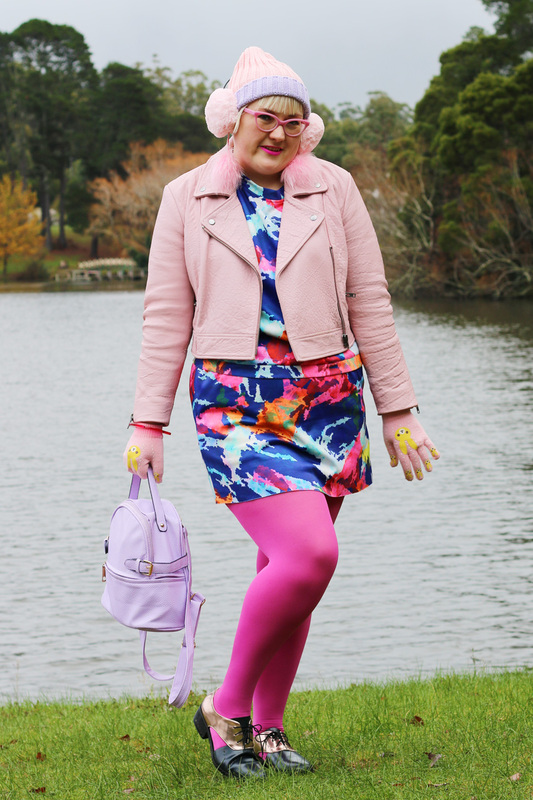 As Buzzfeed said recently of my style it's "retro meets rainbow, and shows that bright colours shouldn't be confined to the warmer months"!!! These photos were taken on a cold and rainy day whilst we were away in Daylesford, at beautiful Lake Daylesford. Did I mention it was absolutely freezing cold and lightly raining when we decided to walk around the lake? 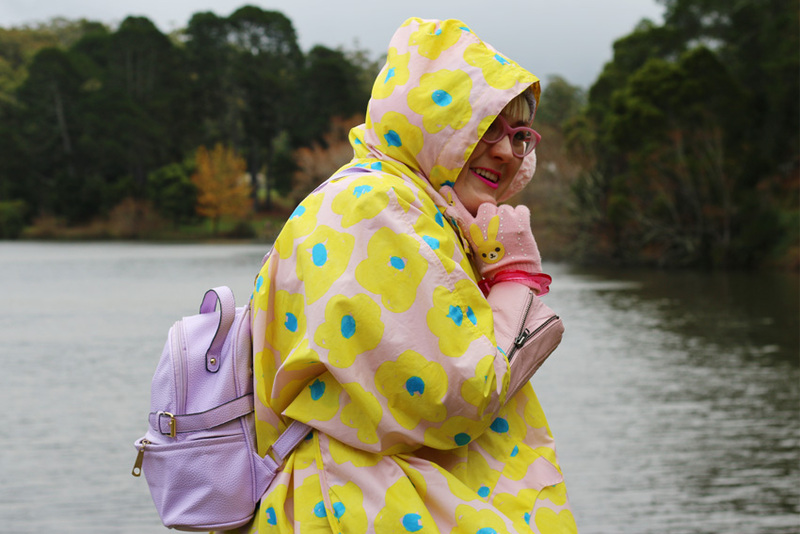 Thankfully I had my trusty and oh so bright Tsumori Chisato raincoat to layer over my outfit to keep the rain at bay, which had all the Daylesford locals and tourists starring at me as I was the brightest person in the whole town that day. Underneath the raincoat I was wearing my trusty pink Gorman leather jacket which kept me toasty warm. A biker jacket is a must have piece for winter in my opinion, and I love owning one in statement making pink! 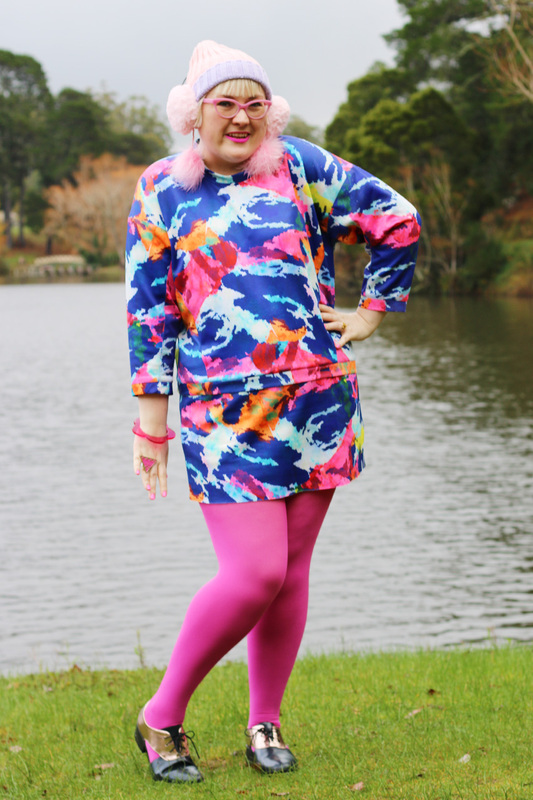 My outfit was this Shakuhachi two piece co-ord tie dye neoprene jumper and mini skirt that I picked up at their store in the Emporium on sale. Neoprene get's a bad rep from a lot of people who don't like the texture, personally I find it really warm and comfy and I love how bright this set is. Protected from the rain in my hooded raincoat from Tsumori Chisato. My Daiso gloves help keep me warm too. 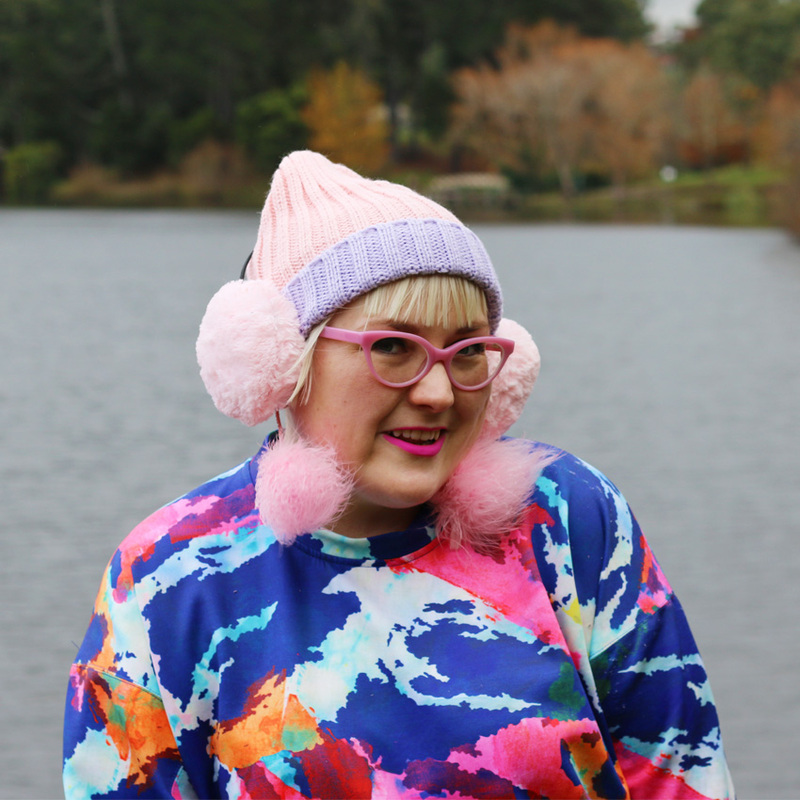 As does my Daiso beanie and earmuffs! 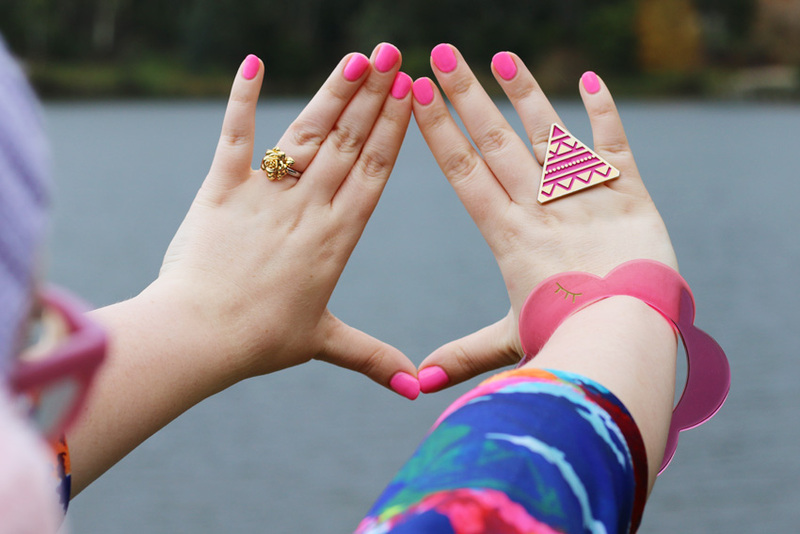 Perfect winter basics in my favourite shade of pink! Flower bangle Tsumori Chisato, was my bday pressie from my bff!!! Gold flower ring Marc by Marc Jacobs, was my bday pressie from Henry!!! 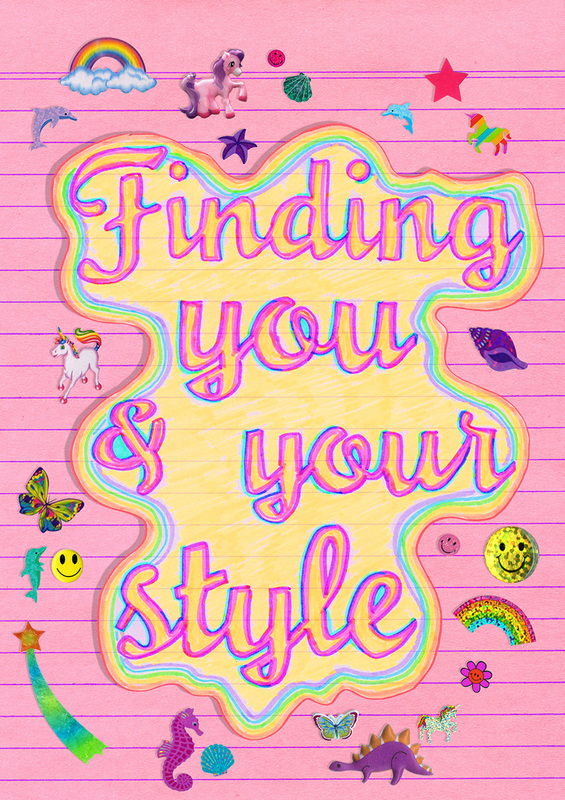 Your outfits always bring a smile to my face because they are so bright and cheerful! I still cant believe its winter there, as here in germany we are experiencing summer! I wish you all the best for your class! Oh! I haven't looked at your blog for a while, and what a bright young thing you are today! I also love Lady Petrova! Well done on all the things! I've had a few sewing endeavours with neoprene, and would love to try a co-ord of something.... Happy Daylesford to you guys! Awww...so cute! You are so adorable.